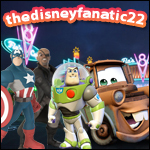 Disney Infinity Fans • View topic - What is the game like to play? I would like to know from those of you who have played that are just normal everyday people. How is the game? I see the trailers of all you can do but is any of it great? Is racing/fighting/competing in sandbox mode really fun? Or is it really basic? In a fighting game can you knock out the opponent and play rounds? Tournaments? Or do you just run around knocking each other over? A trailer shows that you can fight, race, play soccer, etc... But are each if these great? I won't be much help with this question, but I know that for the people that have been lucky enough to already try out the game, these questions would be really hard to answer. From what I have heard, the people who have had the opportunity to demo the game have not had a whole lot of time. For example, at the Disneyland demos they had earlier this week, I have heard people only got to play for a short period of time. I could be wrong, but these questions might be really difficult to answer with the short amount of time people have gotten to demo it. Re: What is the game like to play? Thats what is driving me crazy, is a trailer will show 20 different things in a matter of seconds... and in most of the hands on stuff from e3 its them building not playing in the built set.